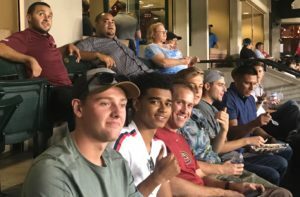 SkyWest cadets in the Phoenix area were treated to a night at the ballpark last week, as more than 40 joined SkyWest Airlines to watch the Diamondbacks win on a walk-off home run over the Dodgers at Chase Field. 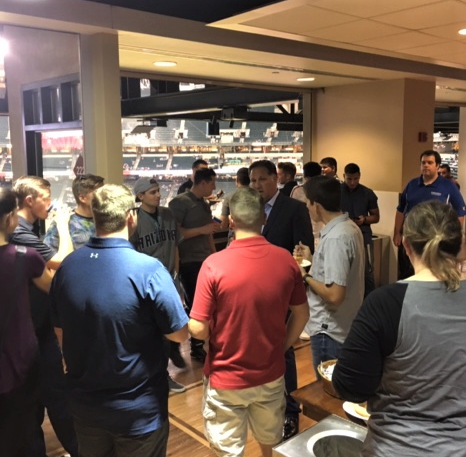 The event was sponsored by SkyWest and gave cadets the chance to interact with pilot recruiters and Tracy Gallo, SkyWest’s VP of Flight Operations, while also enjoying dinner, and a great baseball game! 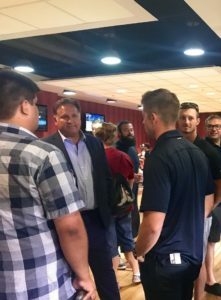 SkyWest’s evening at the ballpark is just one of several cadet-focused events that have taken place throughout the year. Barbeques, meet and greets, golf tournaments and more complement the opportunities for regular connection with SkyWest mentors SkyWest cadets receive throughout their aviation journey. The Pilot Pathway Program provides a defined path for those desiring to take control of their aviation careers. Company seniority activates upon becoming a cadet, and pilots earn increased seniority within SkyWest’s ground class. Upon completion of the program, cadets have a guaranteed final interview for a SkyWest first officer position and may become one of SkyWest’s more than 4,000 pilots. Learn more about the Pilot Pathway Program. SkyBlog is the official blog of SkyWest Airlines. Here you can learn about our amazing people and some of the destinations we serve around North America! SkyWest is a leading air service provider offering global access to millions of people each month in partnership with United Airlines, Delta Air Lines, American Airlines and Alaska Airlines.